There's a mystery afoot in the Vermont countryside in the summer of 1846. A wandering artist, who paints portraits of animals "as they wish to be seen, visits town after town where pets and livestock have suddenly disappeared. Horses, cows, cats, and pigs--kidnapped The only creatures that seem to have a clue to the thefts are the animals that witness the crimes. But how can the painter figure out what his models are trying to tell him? In each town the artist visits, the mystery continues to build, until it culminates in September with a stunning revelation at the Rutland County Fair. 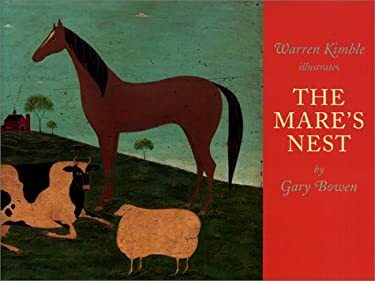 Inspired by the wood paintings of internationally acclaimed Vermont folk artist Warren Kimble, "The Mare's Nest by Gary Bowen is a timeless story set in the appealing landscape of rural New England.